Disclosure & Notice: Key provided by Feral Interactive. There will be spoilers in the review and video. If you're on Ubuntu/Mint you can grab a fresh Nvidia driver from this ppa. Reminder: Your machine will be different. It’s another title to use Feral’s new Linux launcher which I really love. Being able to select your monitor and resolution before the game loads is a really big help when you have more than one monitor. The amount of games that either start in a poor resolution, or on the wrong monitor can be infuriating, so Feral have taken steps to improve their games for us. The game has full support for AMD’s TressFX, which is essentially fancy hair. Personally, I think it’s awesome and it does make characters hair look a lot more realistic, but it can tank performance down quite a lot. I’ve mainly done my testing on the High preset, but with TressFX turned off. I feel this gives me the best performance without sacrificing a good looking game experience. I have been mainly testing it at 1920x1080 resolution. 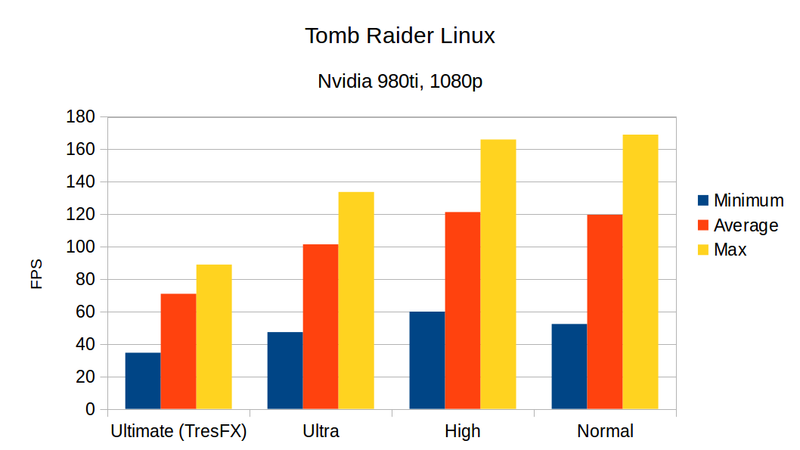 I have to say the performance is generally quite good (on my machine), but certain areas can be quite bad. I was initially very impressed during the heavy action going on towards the start, as the framerate seemed to stay mostly above 100FPS. Once I got outside, the performance did dip down to 60-70FPS, which is still pretty great considering the settings. The problem is that later on in the game when you’re in certain areas I’ve seen my FPS dive bomb down to 20-30FPS. It does feels sluggish at times too, but luckily I’ve come across very little stutter. That’s only in a few certain areas though, it will level out again when you leave them. The performance will shoot right up when you’re inside certain enclosed areas, as there’s not so much going on. You do go into a few caves and buildings quite often, so parts of the game will perform a lot better than others. I have no doubt Feral will work on the performance issues with certain areas. They have so far proven themselves to be capable developers with updates to their ports bringing performance enhances and general fixes. They don't get a free pass though, the game does have performance issues. Update: I did the livestream as promised, and you could see the performance issues at times. I will try to get the video up soon. 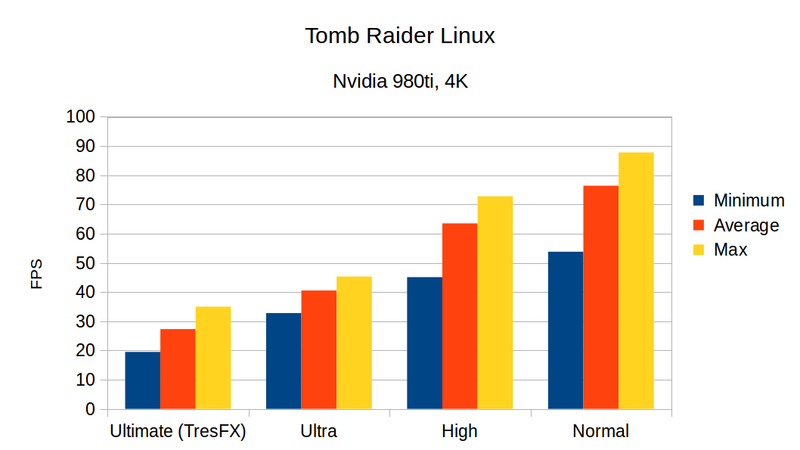 The game has a built-in benchmark mode, so I will let the numbers speak louder than my ramblings. One important thing to note is that the actual game is quite a bit heavier than the benchmark, but it will at least give you an indicator of performance. Tomb Raider is a very different breed compared to the previous games in the series, and I’ve played a number of them so I am well aware of the differences. I’m not the type that gets annoyed when games are rebooted, and I think the developers created a really great game here. You’re introduced to a bunch of characters at the start, but you never really see anyone but Lara grow in the game. It would have been interesting to see more of them, but this is really about showing how Lara Croft evolved into a hardened survivor. The game is set on a beautifully presented weather-torn island where disaster is common, but you decided to set sail for it anyway. What’s a game without a really stupid decision like that anyway? I’ve tested it with both mouse & keyboard and a Steam Controller and both work beautifully. I’ve had zero issues with the input for the game so it should satisfy you however you wish to play it. The control system is beautifully simple, from climbing to jumping ledges and firing off rope arrows for a make-shift ziplines. Just generally running around taking it all in is great, especially great since the environments are so beautifully designed. You also end up doing a bit of mountaineering; jumping from ledges and hooking into mountains. It’s very cool, and certainly gets your heart going. Instead of the battle-hardened Lara we knew from before, we play as a much more emotional and believable character. This is your first real expedition, and you have something to prove. The voice actor for Lara is very good, really convincing of the emotions she is going through and it really helps you stay interested in what’s happening to her. The game is far more brutal than I remember! Nothing about this game eases you into it. The explosive intro scene is awesome and really draws you in from the moment you press that Play button. The island itself has some really beautiful environment art with the mixture of shipwrecks, old warplanes tangled up and the incredible skybox is really something. You will also come across all sorts of wildlife which can make you jump a little when you’re not expecting it. Tomb Raider certainly won’t be for everyone, as there’s a fair amount of quick-time button mashing events. They aren’t too bad, some of them are even pretty damn intense thanks to the action going on and the excellent vocal work by the actor playing Lara (Camilla Luddington). Things like hit F now, or mash this button until something else happens, if you don’t time it right you will be forced to do it again. They tend to be evenly spaced out overall, as the majority of the game has you running, leaping and shooting your way through it. Some mechanics actually feel quite similar to Shadow of Mordor, especially the climbing and finding artefacts/relics that you need to rotate to find clues. I actually quite like hunting around for them and seeing any story to go with them. It also has a survival sense vision to help you find useful items, which also reminds me of the view you get in Shadow of Mordor to seek things out. It’s worth noting that even though we are getting this game after Mordor, Tomb Raider actually came out before it. There’s a moment about an hour in where you’re trapped, alone, and you have wolves circling around you in the bushes. You’re armed with your bow, you don’t know where they will jump out from and lightning is going off, it’s incredibly tense, and probably one of my favourite moments in a computer game in recent years. The combat really does feel really good, with an assortment of different weapons available to you and stealth is even an option. You don’t always want to go in guns blazing, you do have the option at times to also sneak up behind unsuspecting victims for a nice stealth kill. Stealth killing isn’t a quick and easy affair either, you will need to be careful there’s no one else around keeping an eye out. The cover system is automatic too and you duck down behind cover whenever it’s available. This is quite useful as it allows you to really focus on your enemies and not hitting the right button to be sure you’re in cover. You can even distract enemies from behind cover by shooting an arrow at a wall or object near them, or even set them ablaze by shooting out an oil lamp for maximum brutality. There are elements of the original games here too, as there are an assortment of secret tombs to explore for certain rewards like XP and maps. Although the tombs are generally optional from what I have seen they are worth a little exploring. There are seven in total, so you will need to keep an eye out for them. I haven’t had a chance to play the multiplayer yet since the game has only just come out for Linux, but I will be sure to test it out and report back to you on that when there’s enough people playing to get a good idea. Overall, it’s a fantastic game that really draws you in from the moment you load it up and it’s just incredible to have Lara natively on Linux. Although, I would like to see performance improved in a few certain areas. You can buy Tomb Raider on the Feral Store, or directly from Steam. I can recommend it personally as I’ve been loving it. Anyone else for whom it does not download anything on steam? It is up on steam and listed in their "linux games" list though, to be fair. Nice to see you had a pre-release review copy. Little typo, its TressFX (source: https://en.wikipedia.org/wiki/TressFX) not TresFX . Binogure Little typo, its TressFX (source: https://en.wikipedia.org/wiki/TressFX) not TresFX . Doh, I checked and was sure! Apologies, I will blame it on this savage cold I have. Great review, Liam. Makes me happy to be a GOL Supporter. Now a good reason to buy this game on steam! Personally, I thought Lara's "growth" in the game was hilariously shallow and sudden. She goes from struggling with having killed a person (which was a nice show of emotion) to murdering a dozen Russians five minutes later and not even batting an eyelash. Welp, she got over that quick. Keyrock Personally, I thought Lara's "growth" in the game was hilariously shallow and sudden. She goes from struggling with having killed a person (which was a nice show of emotion) to murdering a dozen Russians five minutes later and not even batting an eyelash. Welp, she got over that quick.